Edinburgh Festival Award Winner and Time Out Critic’s Choice, Mark's recent TV credits include Taskmaster (Dave) and Bear Grylls' Celebrity Island (Channel 4). 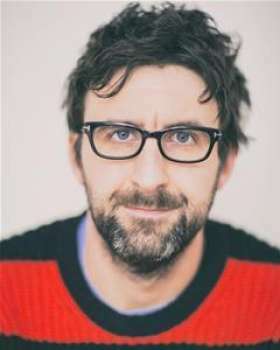 Mark has been the face of shows such as BBC Four’s We Need Answers and BBC Radio 4’s Mark Watson Makes The World Substantially Better. He has also appeared on Mock The Week, Celebrity Pointless, Have I Got News For You, Would I Lie To You?, Live At The Apollo and Channel 4’s Comedy Gala. He is currently recording another series of his hit Radio 4 show Mark Watson Talks A Bit About Life. In August 2016, Mark performed his latest show I’m Not Here at the Edinburgh Festival, and then went on to tour it around the UK from September – December 2016. The show has received 4 & 5 star reviews. Not only a Stand-Up, Mark has written six novels: Bullet Points (2004), A Light-Hearted Look At Murder (2007), Eleven (2010), The Knot (2012), Hotel Alpha (2014), and The Place That Didn’t Exist (2016).